I’m a little behind on posting my week 4 update, but that’s because I’ve been so busy making my home a haven! We really went all out this past weekend getting out our decorations and making our home feel cheerful and cozy. 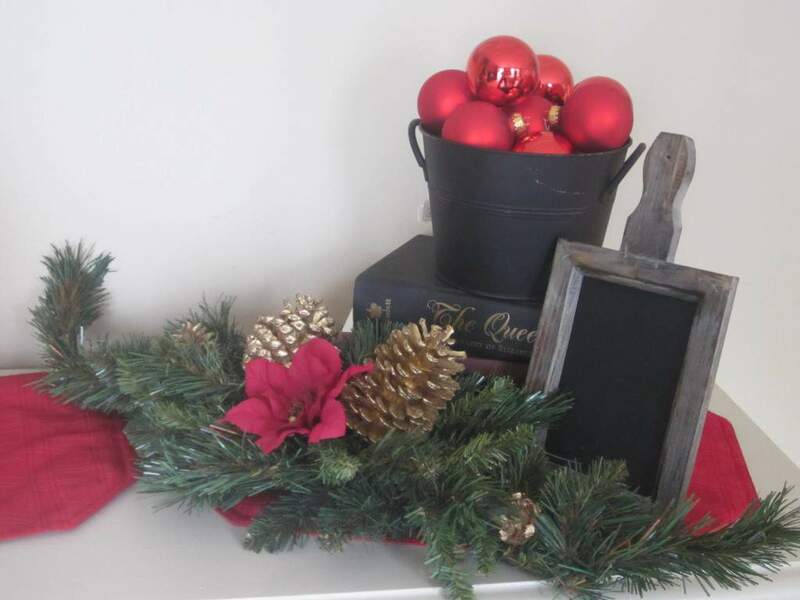 I got this adorable little bucket from my favorite shop in Pennsylvania a couple of weekends ago and I was so happy to use it in my holiday decorating! I just threw some red bulb ornaments inside, making it look so festive. I haven’t decided what to write on my little chalkboard yet, however….maybe a plain Merry Christmas will do? 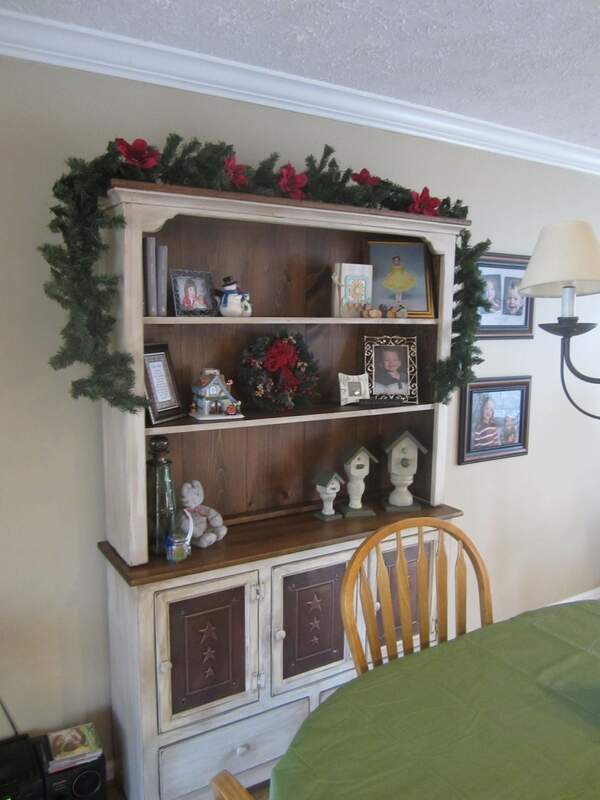 I put my trusty old Christmas garland up over the hutch again this year, along with some silk poinsettia flowers. We’ve had this since our first Christmas together…way back in 2000…and it still looks good every year! 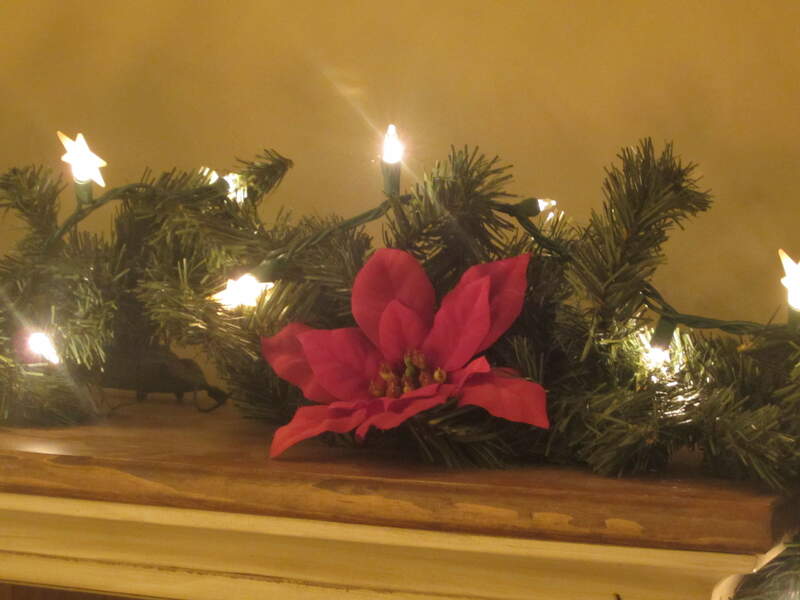 Later in the week, I added a string of white lights to the garland. I found some star tips at the same store up in PA, and added them to the lights here. I like that little bit of country that it gives to the garland. 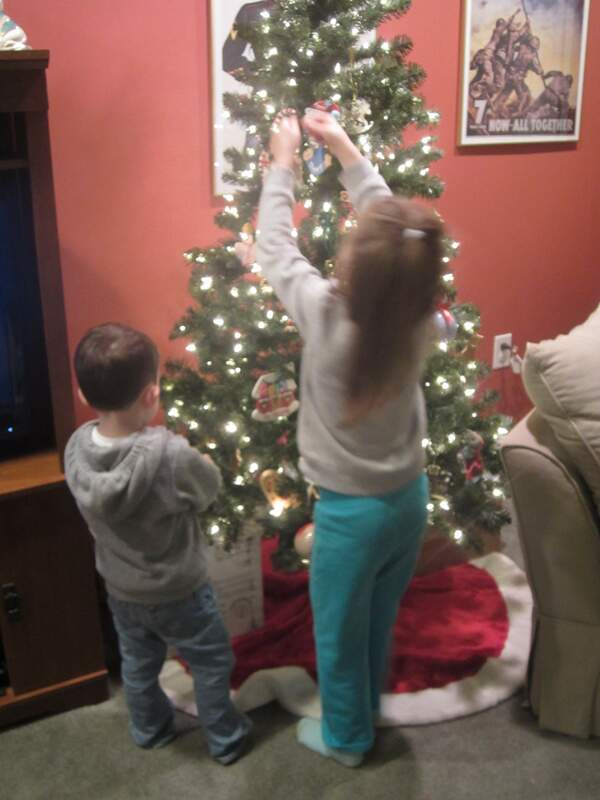 The kids did their share of the work down in the basement, where they helped with the Christmas tree. My hunky Christmas light-putter-upper did a good job on the outside of the house too! 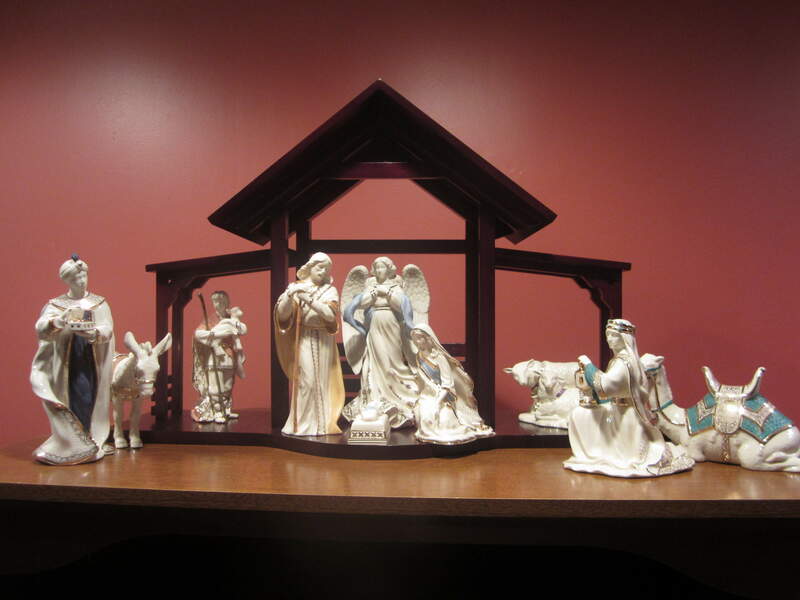 And last, but certainly not least, our Nativity set. My mother-in-law gave us one or two pieces every year for Christmas after we got married, and now it is one of our most cherished possessions. We put it up high since our kiddos are still little and tend to break things, but they still get to see Baby Jesus up in his little manger. 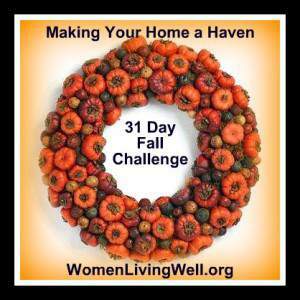 Well, that’s it for the Making your Home a Haven series! I’m a little sad to see it end, since it helped me to really focus each week on making our home a warm, welcoming and restful place for my family. But I think we’ve seen some great results because of it, so for that I’m very thankful. We just got out our decorations today. So we are working on them now. We usually put them up the day after Thanksgiving but since we have all been fighting this cold for the last 2 weeks I wanted to wait until we were all feeling better. So today is the day. I love your nativity. I have one that was my moms and I think it was made back in the 50’s. The kids just got done setting it up. 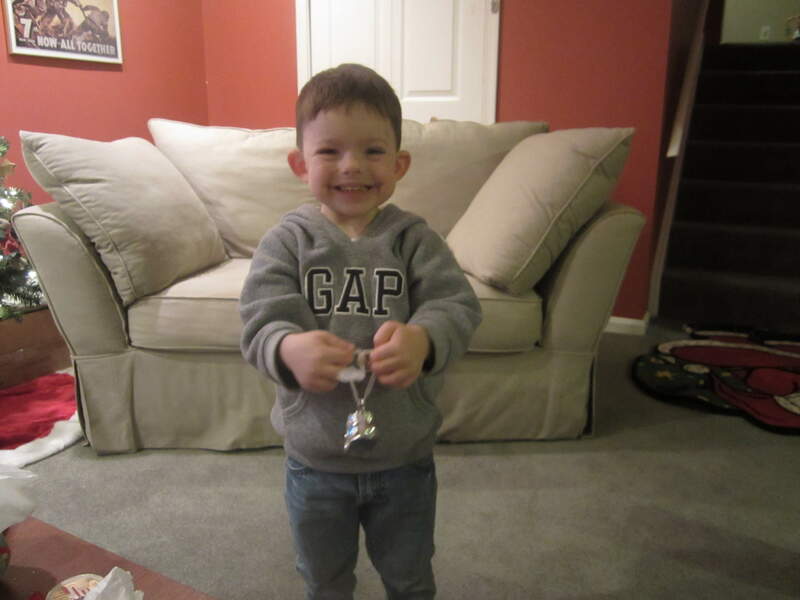 So now we are off to decorate the tree. Thank you very much Shelly! 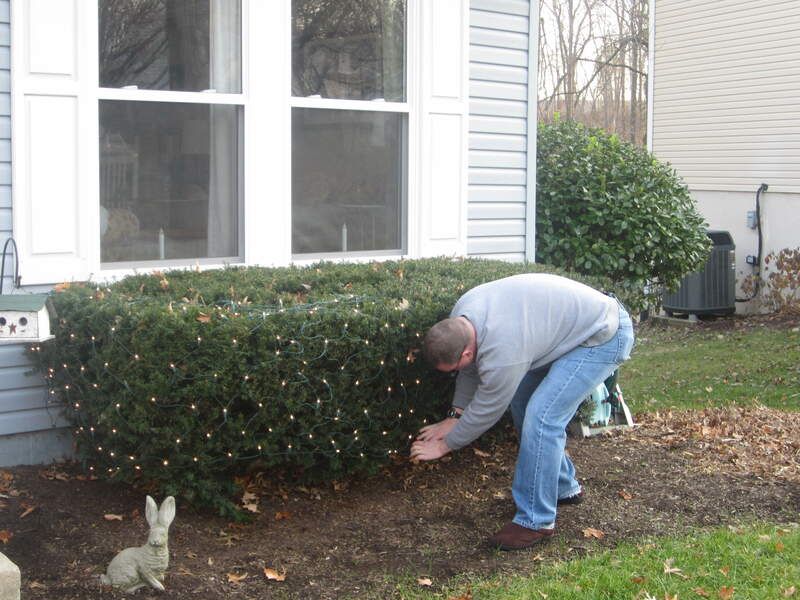 We usually decorate the day after Thanksgiving as well, but we didn’t get around to it this year until a few days later. You must really treasure your Nativity set 🙂 How special to have your mom’s set!